In case you missed it last week the Department of Labor come out with the November Jobs report and it was another solid showing for new jobs. Here are the highlights. The report also indicated that on average, weekly paychecks increased by 3.1% over the last 12-months, the first time that reading has topped 3% in nearly seven years. 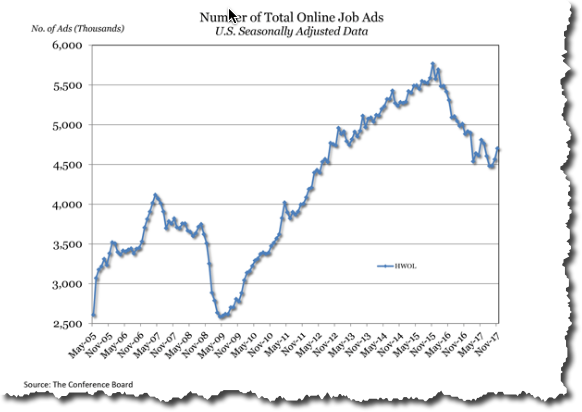 Online advertised vacancies increased 137,100 to 4,700,900 in November, according to The Conference Board Help Wanted OnLine® (HWOL) Data Series,released today. The October Supply/Demand rate stands at 1.43 unemployed for each advertised vacancy, with a total of 2.0 million more unemployed workers than the number of advertised vacancies. 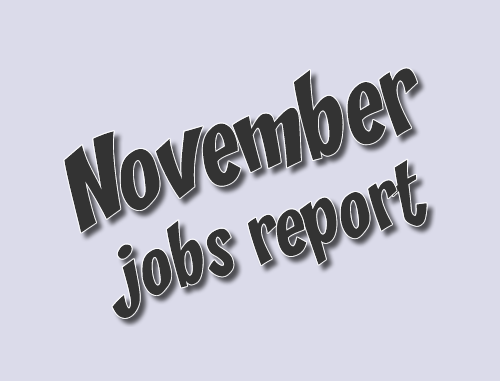 The number of unemployed was approximately 6.5 million in October. The Northeast increased 16,700 in November. Pennsylvania increased 7,400 to 203,000. New York increased 3,900 to 284,300. New Jersey increased 3,500 to 151,600. Massachusetts increased 1,700 to 136,700. In the smaller States, Connecticut decreased 300 to 65,800. New Hampshire increased 1,300 to 23,900 and Maine increased 1,200 to 17,400. Rhode Island increased 400 to 14,400 and Vermont grew 300 to 10,100.